The United States is in the process of staking out not just the globe but the last unarmed spot in our neighborhood-the heavens-as a militarized sphere of influence. Our earth and its skies are, for the Bush administration, the final frontiers of imperial control. In Hegemony or Survival, Noam Chomsky investigates how we came to this moment, what kind of peril we find ourselves in, and why our rulers are willing to jeopardize the future of our species. With the striking logic that is his trademark, Chomsky dissects America's quest for global supremacy, tracking the U.S. government's aggressive pursuit of policies intended to achieve 'full spectrum dominance' at any cost. He lays out vividly how the various strands of policy cohere in a drive for hegemony that ultimately threatens our survival. In our era, he argues, empire is a recipe for an earthly wasteland. 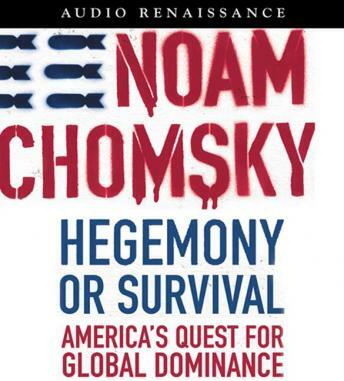 Lucid, rigorous, and thoroughly documented, Hegemony or Survival promises to be Chomsky's most urgent and sweeping work in years, certain to spark widespread debate.